blessings on you having a wonderful creative weekend and screw the work. congratulations on the awards. I don't usually like getting them myself (too much stress) but enjoy seeing other's awards and finding new blogs. I love this post of honesty. Wow - I'm trying to think if I can mine any more honest stuff that hasn't be broadcast. There might be one or two new things. Others might be repeats. Thank you for the tag. I agree, though I'm hopped up on Oreos and appetite suppressants (I know, those don't go together! ), and grammar and typing seem quite hard this morning. I really laughed at the hating a smell, but sniffing the thing anyway. That's such a human gesture. steve, what a fun way to get to know someone and only possible, to my way of thinking, in blogland, where we don't actually get to see each other, face to face, just mind to mind, which is so much more intimate!! no one would ever stand around discussing the 10 things nobody knows about them ! you have to come up with some good ones here and i am challenged to really ponder my own and do i want to share them would probably be the deeper question....but since you asked, I will try and muster up something worthy of the challenge...about that pumice soap, it's very interesting how you see/feel it! and i also have 3 moleskins i don't use but love them anyway and always think someday i will...reading this made me realize exactly why i don't...i'm a painter not a sketcher too. Thanks, Steve. This is my first night off from sanging all week, so I just caught on. I was in difficulties coming up with stuff I hadn't already blabbed about, so I cheated and got Andrew to help me with the last few. 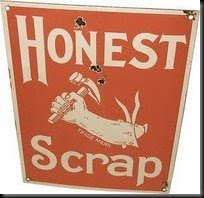 Thank you for sharing your honest scraps. Have you ever smelled Kefir? It has a similar love/hate aroma for a lot of folks. Linda - Yes, blogging allows some remarkable things to happen. I love this medium. I only realized my problem with my moleskines as I wrote that post - and I'm not at all surprised that you have the same thing going on. Looking forward to reading your 10 items, if you do it. DebD - Thanks so much, and thanks for coming by. I've been enjoying reading what you are reading - even if I never get around to posting anything myself on there (I'm lucky I squeeze in some reading). Michelle - Thanks for the giggle! Summer - I have to come look.